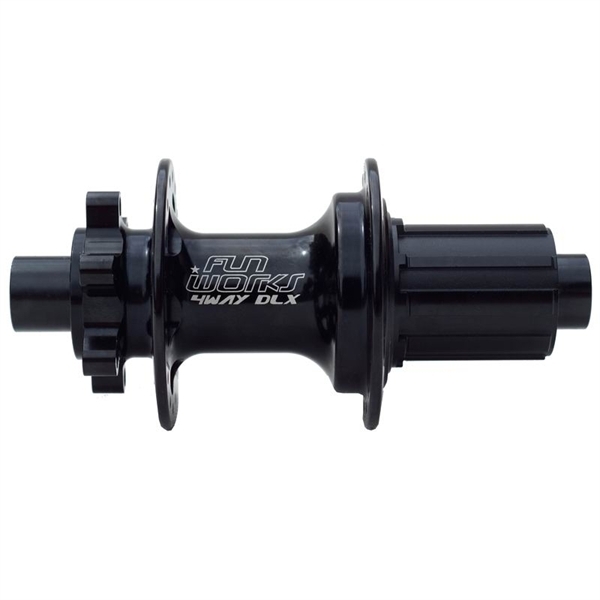 Product information "Fun Works 4Way DLX 48T IS disc Rear Hub 6-Bolt"
The Fun Works 4Way DLX the big brother of the N-Light One have been constructed with larger bearings and bigger hub body for increased strength. This hubs are still very light and can be used in your All Mountain,Enduro or Freeride Bike.In the new Freehub are working 4 simultaneously engaging pawls with a 48 teeth Ratchet Ring.The result is a 37,5% quicker engagement of the pawls (compared to the previous model 4Way Pro) and thus faster acceleration and more control in demanding terrain.The hub shell is forged and CNC machined for maximum durability furthermore a high durometer main seal is integrated into hub shell.The new shoulderless designed axle offers incredible strength and the end caps with LipLock Seal Technology are protecting the bearings more effective and locks the caps into place.The 4Way DLX hub is still easy to convert to different axle standards without special tools.You just have to swap the end caps.Shimano standard compatible freehubs will be supplied ready to take 11sp Road or MTB cassettes.A spacer for 8/9/10speed is included to each hub. Related links to "Fun Works 4Way DLX 48T IS disc Rear Hub 6-Bolt"
Customer evaluation for "Fun Works 4Way DLX 48T IS disc Rear Hub 6-Bolt"